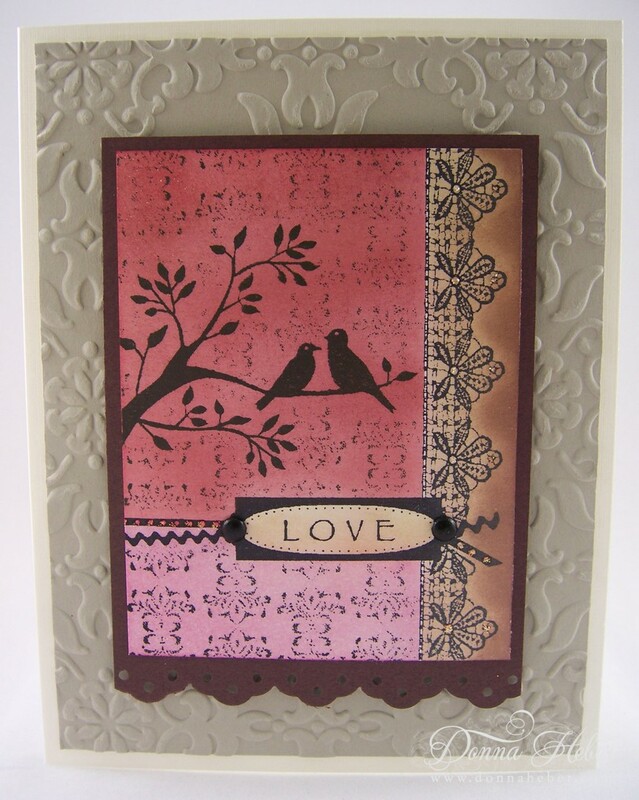 I created this card by stamping the image in StazOn Black on Shimmery White paper then masked off each section and sponged Cherry Cobbler, Pretty in Pink and Brilliance Pearlescent Beige & Chocolate. I added Diamond Stickles to the lace edge and two black brads to mimic a tag. The eyelet border punch was used on the piece of Chocolate Chip and I ran the Sahara Sand paper through my Big Shot with the Vintage Wallpaper Embossing Folder. Just think of all the possibilities and color combinations you can use. This can also be a pretty anniversary card. Quick and easy! love those birds and the colors are great to. you have made a beautiful background. This is beautiful, love the colors. Beautiful elegance, Donna! Love those birds and the elegance of the border! Love the love birds. Too cute. Oh how beautiful!! Love the birds-so cute. This is such a classy and elegant card! Love your colors! Very nice! I particularly like how natural your sponging looks. Your card is beautiful! I love the images and the border! Thank you so much for the blog award! I hope to get it displayed this week! Love the masking effect! Great on Shimmery White paper. Ack! This is so pretty! And I have a friend looking for love birds for a wedding invite! This is perfect!